While the First American Revolution was about liberty, which, among other things, meant a license for some men to own slaves, the Second American Revolution was fought over freedom. This broader concept went beyond emancipation to extend the right of self-determination and self-expression to those of all races. The conversation over the definition and limits of freedom that took place in America prior to, during, and after the Civil War, was led, in large part, by Horace Greeley and the newspaper he edited, the New York Tribune (now the New York Herald Tribune). Williams, who teaches history at Bates College, demonstrates that Greeley was a “very consistent, if unsystematic, thinker with a lifelong and passionate commitment to the cause of freedom and reform.” Students of the Civil War era will welcome the author’s investigation of Greeley’s life and influence. Williams traces the origin, development, and application of Greeley’s core values of justice, hard work, generosity, and temperance, and his evolving idea of freedom. The New England farm boy became a printer’s apprentice at fifteen and moved to New York City at twenty. Greeley was involved in Whig Party politics until the emergence of the Republican Party, whose identity he helped to shape, before the Civil War. He was an ally of Abraham Lincoln, but Greeley pressured Lincoln, personally and editorially, to emancipate the slaves and hasten the end of the Civil War. Greeley himself ran for the presidency in 1872 and died shortly after he was defeated. Greeley was a New York newspaperman, but his Tribune Weekly Edition, distributed throughout the country, gave him national exposure. His paper was thought to be second in popularity to the Bible. 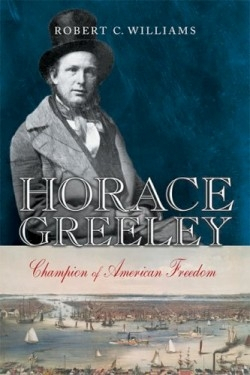 As “Uncle Horace’s” mouthpiece, the Tribune broadcast his belief that freedom was crucial to the republic. But Greeley wasn’t simply an advocate. Williams calls him “a gatherer, transmitter, and reflector of ideas, a kind of switchboard operator for international republicanism.” The Tribune reflected Greeley’s flirtation with the associationist ideas of Charles Fourier and the transcendentalist works of Margaret Fuller, Ralph Waldo Emerson, and Henry Thoreau. Greeley brought the freedom rhetoric of the 1848 European revolutions to American readers via Karl Marx, among others. Greeley was not a socialist, however. His famous exhortation to “Go West!” expressed his view that economic opportunity was available in the small towns and homesteads of the American frontier.